As stage one of Mirvac’s Waterfront development nears completion, stage two is powering ahead. 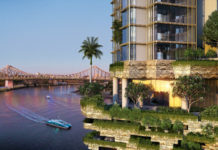 Waterfront, which is being developed by Mirvac is progressively taking shape in one of Brisbane’s newest inner city regeneration areas. Stage one of Mirvac’s Waterfront development includes two buildings – Pier South, a five storey building and Pier North, an eight storey building. This first stage which can now be seen from Kingsford Smith Drive is scheduled to be completed by the end of 2010, with residents expected to start moving in early 2011. As shown in the image above, landscaping is currently underway and will include 5 hectares of public parkland as well as an artificial lake which will surround Pier South. The quality of internal fit outs in Waterfront is nothing short of amazing. Mirvac has put a lot of time and effort into ensuring a luxury product unlike anywhere else in the Brisbane residential market. The developer uses its own interior designers in mostly all of their projects and has appointed a well known New Farm-based interior decorator Black and Spiro to furnish the display centre. Pier South houses some of Brisbane’s last remaining direct waterfront apartments, where there are uninterrupted views of the Brisbane River. It also houses the development’s most premium apartments, including the Pier South penthouse, which was sold for around $14 million dollars upon first release. Stage 2 is being called ‘Park’ (shown second from the right above) due to its outlook over the planned parkland. This building is 16 storeys high with ground level cafes, restaurants and convenience retail outlets. Apartments in this tower are priced at $495,000 for one bedroom units to $1.6 million for pavilion apartments and are recording strong sales, likewise for stage one. While stage one (Pier North & South) nears completion, construction of stage two ‘Park’ has now commenced, with basement excavation underway. 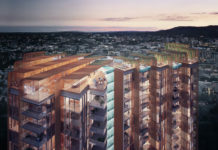 All Waterfront apartments come with car spaces, however with the new addition of Brisbane City Council’s frequent City Glider service from West End to Newstead, transport options in this fast growing area are plentiful. Mirvac has future plans for further new stages with building heights from 20 storeys. The Brisbane City Council’s recent neighbourhood plan revisions have allowed development of taller buildings, which in turn has increased the scale of the parkland, while reducing building footprints.